French has three negative constructions that are reserved for formal (usually written) French like literature and historical accounts. In normal French, "not" is equivalent to the negative adverb ne … pas. In formal French, it’s ne … point. Le château tombe en ruines. > Le château ne tombe point en ruines. 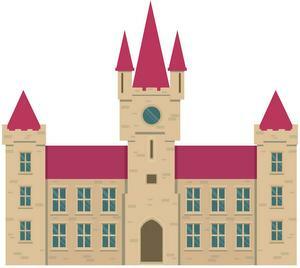 The castle is falling into ruin. > The castle isn’t falling into ruin. > Nous ne sommes point prêts. We’re ready. In all other respects, ne … point is used exactly like ne … pas. a) Ne precedes the verb and point follows it. When the verb is inverted, point follows the subject pronoun. b) Whereas in English negation, the helping verb "do" must be added to most verbs (learn more), in French, if there’s one verb in the affirmative, there’s just one verb in the negative. Likewise, if there are two verbs in the affirmative, as in compound tenses/moods and dual-verb constructions, there are two in the negative. Ne and point go around the first (conjugated) verb, followed by the past participle or infinitive. > Il n’a point mangé. He’s eaten. > Ne voulez-vous point sortir ? Do you want to go out? However, when there’s just an infinitive being negated, ne and point stay together in front of it. Je vous ai dit de manger. > Je vous ai dit de ne point manger. I told you to eat. Il espère voir la château. > Il espère ne point voir le château. He hopes to see the castle. > He hopes to not see the castle. > Je ne veux point de pain. I want some bread. > N’avez-vous point de stylo ? Do you have a pen? Certain verbs and constructions can be made negative with just ne – the inclusion of point or some other negative word is not required – learn more. 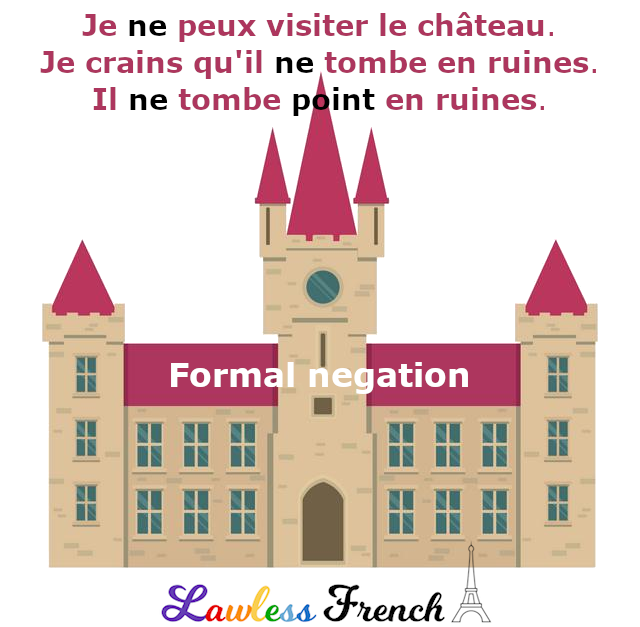 Unlike ne … point and the ne littéraire, which actually negate verbs, the ne explétif does not add any meaning – negative or otherwise – to the sentence; it’s just there to draw attention to what precedes it – learn more.